ST. GEORGE – The pit bull discovered shot with an arrow outside of Ivins Friday, originally nicknamed “Remy,” has received a new name and a foster home. The veterinary staff at Red Hills Animal Hospital in St. George decided to rename the pit bull “Sarge” in honor of Washington County Sheriff’s Sgt. Kurt Bowen who found the pit bull early Friday morning, performed triage, wrapped the pit bull and stayed with him until help arrived. The dog was shot from behind, Ivins Animal Shelter Director Aggie Smith said, and the arrow went all the way up to his stomach, nicking his intestines in two or three places and injuring the outer area of his pancreas. The arrow blew out the area underneath the dog’s stomach, Smith said, and the dog’s interior fat pushed out as a result of the injury, which ultimately saved his life. Sarge underwent a three-hour surgery by Dr. Scott Hannig, who said the pit bull has a good chance of recovering. Smith announced Friday evening that Sarge was in need of a temporary foster home. 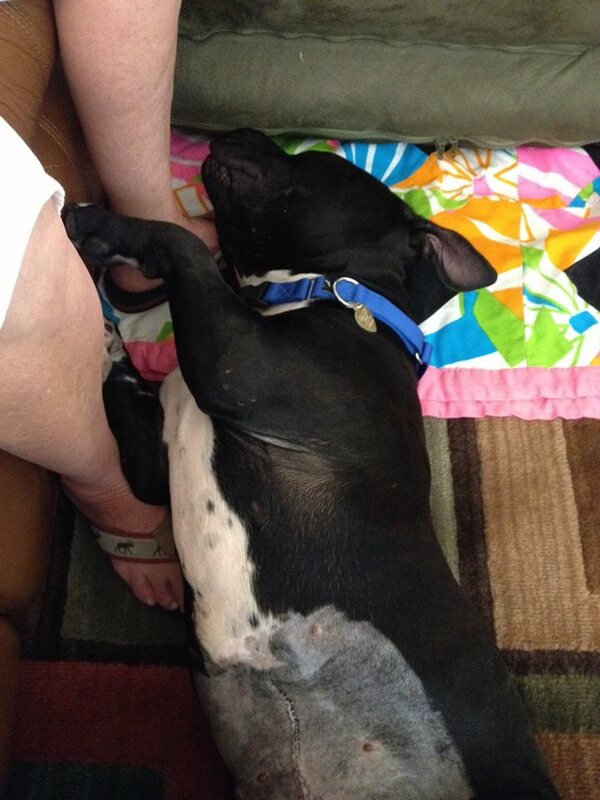 By Sunday, the pit bull had already been placed with a foster family with whom he can recover and be cared for. Sarge feels quite at home! He is doing really well, eating like he hasn’t eaten in months and wanting to play! Unfortunately, we have to restrict him somewhat … he is allowed to eat only so much at a time, no running, etc. Hopefully, when we take him to the Vet tomorrow, we will get a great report and know that we are doing the best we can! It’s no chore .. .he is such a loveable boy and seems so grateful for all the care and love he is receiving! We will continue to post so everyone can rest assured Sarge is in good hands!!! He barked for the first time today and is ready to play!!! It is still unclear if someone took the pit bull out to the desert area to be used as target practice or if he was an abandoned animal, Smith said. The area where the pit bull was found is a common dumping ground for people who abandon their pets. Anyone with information about who may be responsible for shooting or abandoning Sarge is asked to contact the Ivins Animal Shelter at telephone 435-628-1049, or call Smith directly on her animal control mobile telephone 435-669-7043. Awright! Good job, Kurt, from your former neighbor; now in Alaska!